My boyfriend (who has been amazing through all of this and is always telling me off for scratching) has very long, thick dreadlocks. He washes them (once in a blue moon) with bicarbonate of soda. Having listened to me moaning on about all the different lotions and potions I had tried that were no good, he suggested I give the bicarbonate of soda a go. Given that had really nothing to lose... I did. Arron uses the usual common or garden bicarbonate of soda that you get in the baking aisle of the supermarket. It's called baking soda in America (baking powder is something different so don't buy this!) He mixes a few spoonfuls of it with water in a jug, tips it over his head then massages it into his scalp, giving it a good scrub. (I know this because I helped him do it last time!) I used this technique myself, and I also tried just rubbing the bicarbonate of soda straight into my wet scalp, which also works well. Then rinse out as you would usually with a normal shampoo. You don't get a lather when washing your hair with bicarbonate of soda/ baking soda, so it's not the most luxurious shampooing experience, and you do need to take care to wash it all out. But it seems to be quite effective at getting rid of the scalp build up/ cradle cap and it leaves your hair squeaky clean. It isn't conditioning at all so it can make your hair tangly (not a problem if you have dreads!) What I've been doing though is drying my hair normally then rubbing a small amount of coconut oil onto the ends of my hair, which seems to work quite well. Because bicarbonate of soda is a pure natural ingredient (and one that's safe to eat too) it's very safe for sensitive skin and you can be sure that there are no nasties in it, unlike some shampoos. I need to try the bicarbonate of soda over a longer period to see how it really works on cradle cap long term but if you're struggling to find a shampoo that doesn't irritate your scalp then bicarb is a pretty safe alternative. It's also really inexpensive and if you decide you like it you can buy it in bulk online at even better value. Maybe you could try both? Baking soda is good for scrubbing your scalp but the ACV will make a good rinse when you've washed the baking soda out. Thanks for this, I'm going to give it a try! My itchy flaky scalp has been driving me (and my hubby) crazy for the last couple of years. 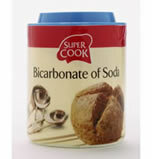 Are you still using bicarb of soda for your hair washing? I have also been struggling with finding a cruelty-free deodorant that works effectively. Just tried out some bicarb today and so far it's working a treat. Hi Mel - hope it works for you! Baking soda is alkaline so will damage the hair, skin barrier/ protective acid mantle, it most definitely is NOT recommended for sensitive skin by anyone who is up to date in dermatology. There are far better gentle sulphate free scalp cleansing products such as Regenepure (contains ketoconazole) or Komaza Care Moja shampoo (pH 4.5). Thanks for your comment Fire Fox. As per all recommendations on this blog, this was are tested first hand by me. I do not claim to be a dermatologist but I did not experience any negative effects. I use Jason shampoo these days for my hair but still do a bicarbonate of soda face scrub about once a week and people tell me I have great skin and look much younger than I am.